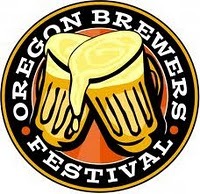 On the heels of last weekend's Concordia Cup, there's more serious tasting tomorrow at the Oregon Brewers Festival. For the first time, I'll be participating in the media tasting, held Thursday afternoon. They will be tasting 15 beers in a range of styles and there will be some commentary by Noel Blake of the Oregon Brew Crew. The idea of tasting beers got me thinking back to my college days, when I would go to the stereo shop to listen and compare speakers. That's how I bought my first pair of speakers. But I returned to the store often to compare what I had with the competition. I was sometimes shocked to find out how bad my speakers sounded when compared side-by-side with others. While they sounded fine in my apartment or dorm room, my speakers often sounded flat or bright next to others. It seems the same thing is true with beer. You drink a beer at home or in a pub and it tastes pretty good. Only when you taste it alongside similar beers do you really get a bead on where that beer fits in. Sometimes you find out the beer you thought was pretty good when you drank it solo ain't so great compared to others of the same style. I'll post tasting notes tomorrow. Looking forward to another great OBF!